The candidate star for the occultation was identified by studying pictures from the MPG/ESO 2.2-metre telescope at ESO’s La Silla Observatory. The observations were carefully planned and carried out by a team of astronomers from a number of (mainly French, Belgian, Spanish and Brazilian) universities using — among others — the TRAPPIST  (TRAnsiting Planets and PlanetesImals Small Telescope, eso1023) telescope, also at La Silla. “Observing occultations by the tiny bodies beyond Neptune in the Solar System requires great precision and very careful planning. This is the best way to measure Eris’s size, short of actually going there,” explains Bruno Sicardy, the lead author. Observations of the occultation were attempted from 26 locations around the globe on the predicted path of the dwarf planet’s shadow — including several telescopes at amateur observatories, but only two sites were able to observe the event directly, both of them located in Chile. One was at ESO’s La Silla Observatory using the TRAPPIST telescope, and the other was located in San Pedro de Atacama and used two telescopes . All three telescopes recorded a sudden drop in brightness as Eris blocked the light of the distant star. 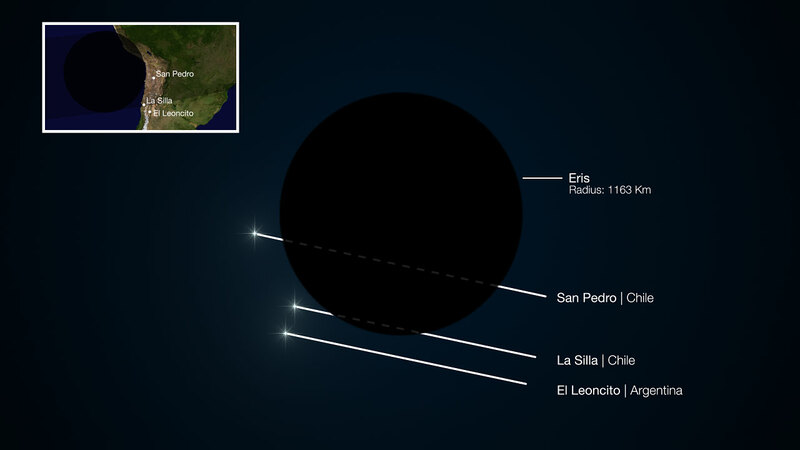 The combined observations from the two Chilean sites indicate that Eris is close to spherical. These measurements should accurately measure its shape and size as long as they are not distorted by the presence of large mountains. Such features are, however, unlikely on such a large icy body. Eris was identified as a large object in the outer Solar System in 2005. Its discovery was one of the factors that led to the creation of a new class of objects called dwarf planets and the reclassification of Pluto from planet to dwarf planet in 2006. Eris is currently three times further from the Sun than Pluto. 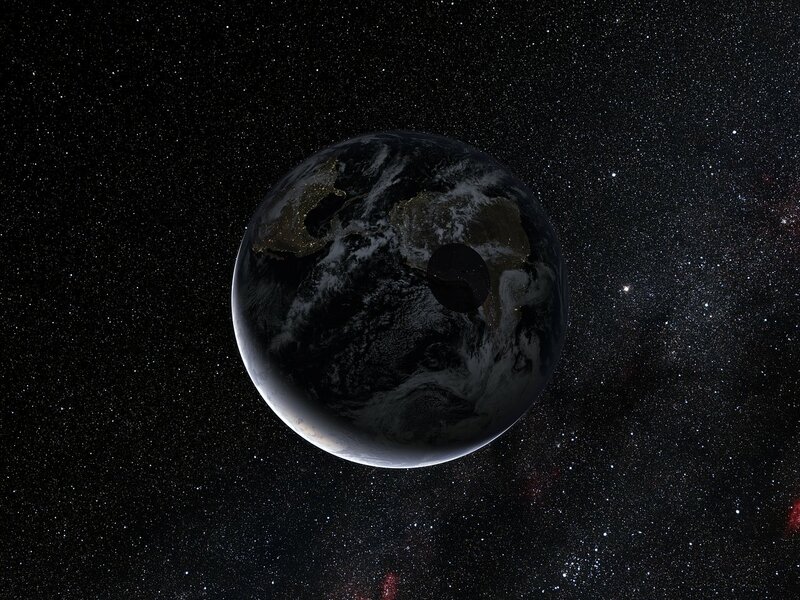 While earlier observations using other methods suggested that Eris was probably about 25% larger than Pluto with an estimated diameter of 3000 kilometres, the new study proves that the two objects are essentially the same size. Eris’s newly determined diameter stands at 2326 kilometres, with an accuracy of 12 kilometres. 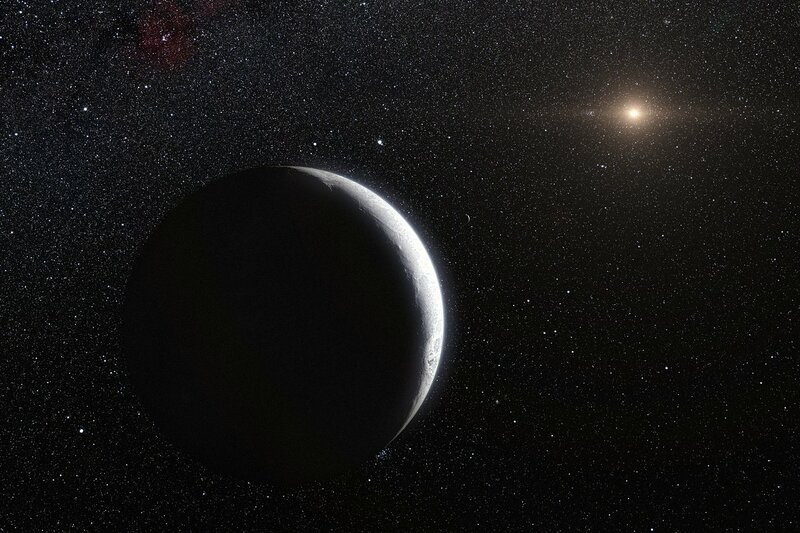 This makes its size better known than that of its closer counterpart Pluto, which has a diameter estimated to be between 2300 and 2400 kilometres. Pluto’s diameter is harder to measure because the presence of an atmosphere makes its edge impossible to detect directly by occultations. The motion of Eris’s satellite Dysnomia  was used to estimate the mass of Eris. 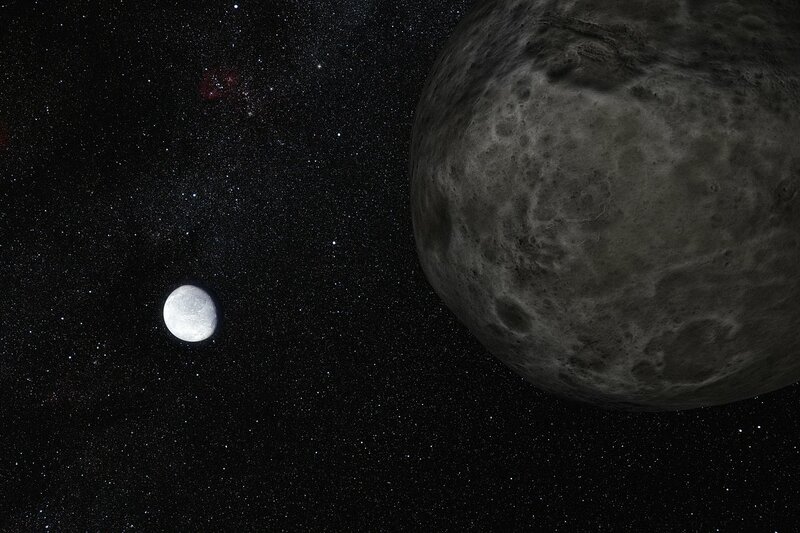 It was found to be 27% heavier than Pluto . Combined with its diameter, this provided Eris’s density, estimated at 2.52 grams per cm3 . “This density means that Eris is probably a large rocky body covered in a relatively thin mantle of ice,” comments Emmanuel Jehin, who contributed to the study . The surface of Eris was found to be extremely reflective, reflecting 96% of the light that falls on it (a visible albedo of 0.96 ). This is even brighter than fresh snow on Earth, making Eris one of the most reflective objects in the Solar System, along with Saturn’s icy moon Enceladus. 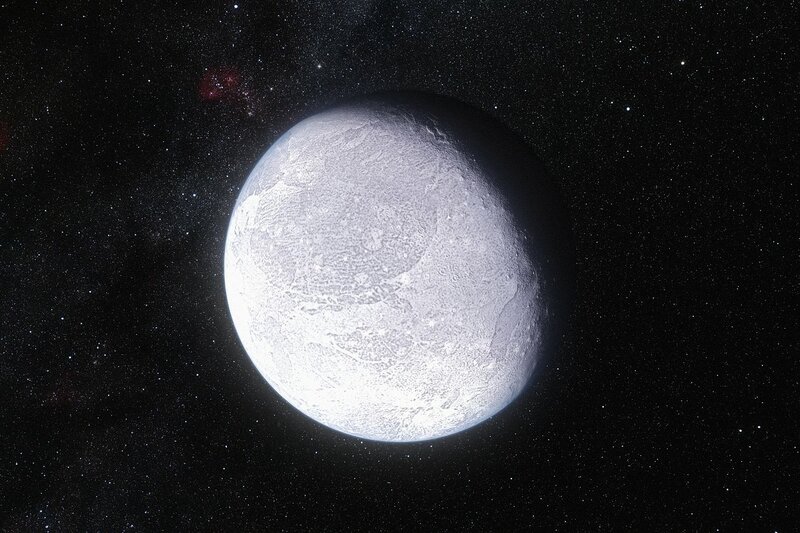 The bright surface of Eris is most likely composed of a nitrogen-rich ice mixed with frozen methane — as indicated by the object's spectrum — coating the dwarf planet’s surface in a thin and very reflective icy layer less than one millimetre thick. “This layer of ice could result from the dwarf planet’s nitrogen or methane atmosphere condensing as frost onto its surface as it moves away from the Sun in its elongated orbit and into an increasingly cold environment,” Jehin adds. The ice could then turn back to gas as Eris approaches its closest point to the Sun, at a distance of about 5.7 billion kilometres. The new results also allow the team to make a new measurement for the surface temperature of the dwarf planet. The estimates suggest a temperature for the surface facing the Sun of -238 Celsius at most, and an even lower value for the night side of Eris. “It is extraordinary how much we can find out about a small and distant object such as Eris by watching it pass in front of a faint star, using relatively small telescopes. Five years after the creation of the new class of dwarf planets, we are finally really getting to know one of its founding members,” concludes Bruno Sicardy. TRAPPIST is one of the latest robotic telescopes installed at the La Silla Observatory. With a main mirror just 0.6 metres across, it was inaugurated in June 2010 and is mainly dedicated to the study of exoplanets and comets. The telescope is a project funded by the Belgian Fund for Scientific Research (FRS-FNRS), with the participation of the Swiss National Science Foundation, and is controlled from Liège. The Caisey Harlingten and ASH2 telescopes. Eris is the Greek goddess of chaos and strife. Dysnomia is Eris’ daughter and the goddess of lawlessness. Eris’s mass is 1.66 x 1022 kg, corresponding to 22% of the mass of the Moon. For comparison, the Moon’s density is 3.3 grams per cm3, and water’s is 1.00 gram per cm3. The value of the density suggests that Eris is mainly composed of rock (85%), with a small ice content (15%). The latter is likely to be a layer, about 100 kilometre thick, that surrounds the large rocky core. This very thick layer of mostly water ice is not to be confused with the very thin layer of frozen atmosphere on Eris’s surface that makes it so reflective. The albedo of an object represents the fraction of the light that falls on it that is scattered back into space rather than absorbed. An albedo of 1 corresponds to perfect reflecting white, while 0 is totally absorbing black. For comparison, the Moon’s albedo is only 0.136, similar to that of coal. This research was presented in a paper to appear in the 27 October 2011 issue of the journal Nature. The team is composed of B. Sicardy (LESIA-Observatoire de Paris (OBSPM), CNRS, Université Pierre et Marie Curie (UPMC), Université Paris-Diderot (Paris 7), Institut Universitaire de France (IUF), France) , J. L. Ortiz (Instituto de Astrofísica de Andalucía (CSIC), Spain), M. Assafin (Observatório do Valongo/UFRJ (OV/UFRJ), Brazil), E. Jehin (Institut d'Astrophysique de I'Université de Liège (IAGL), Belgium), A. Maury (San Pedro de Atacama Celestial Explorations, Chile), E. Lellouch (LESIA, CNRS, UPMC, Paris 7), R. Gil Hutton ( Complejo Astronómico El Leoncito (CASLEO) and San Juan National University, Argentina), F. Braga-Ribas (LESIA, CNRS, UPMC, Paris 7, France, and Observatório Nacional/MCT (ON/MCT), Brazil), F. Colas (OBSPM, IMCCE, UPMC, CNRS, France), D. Hestroffer (OBSPM, IMCCE, UPMC, CNRS, France), J. Lecacheux (LESIA-OBSPM, CNRS, UPMC, Paris 7, IUF, France), F. Roques (LESIA-OBSPM, CNRS, UPMC, Paris 7, IUF, France), P. Santos Sanz (LESIA-OBSPM, CNRS, UPMC, Paris 7, IUF, France), T. Widemann (LESIA-OBSPM, CNRS, UPMC, Paris 7, IUF, France), N. Morales (CSIC, Spain), R. Duffard (CSIC, Spain), A. Thirouin (CSIC, Spain), A. J. Castro-Tirado (CSIC, Spain), M. Jelínek (CSIC, Spain), P. Kubánek (CSIC, Spain), A. Sota (CSIC, Spain), R. Sánchez-Ramírez (CSIC, Spain), A. H. Andrei (OV/UFRJ, ON/MCT, Brazil), J. I. B. Camargo (OV/UFRJ, ON/MCT, Brazil), D. N. da Silva Neto (ON/MCT, Centro Universitário Estadual da Zona Oeste (UEZO), Brazil), A. Ramos Gomes Jr (OV/UFRJ, Brazil), R. Vieira Martins (OV/UFRJ, ON/MCT, Brazil, OBSPM, IMCCE, UPMC, CNRS, France), M. Gillon (IAGL, Belgium), J. Manfroid (IAGL, Belgium), G. P. Tozzi (INAF, Osservatorio Astrofisico di Arcetri, Italy), C. Harlingten (Caisey Harlingten Observatory, UK), S. Saravia (San Pedro de Atacama Celestial Explorations, Chile), R. Behrend (Observatoire de Genève, Switzerland), S. Mottola (DLR – German Aerospace Center, Germany), E. García Melendo (Fundació Privada Observatori Esteve Duran, Institut de Ciències de I'Espai (CSIC-IEEC), Spain), V. Peris ( Observatori Astronòmic, Universitat de València (OAUV), Spain), J. Fabregat (OAUV, Spain), J. M. Madiedo ( Universidad de Huelva, Facultad de Ciencias Experimentales, Spain), L. Cuesta (Centro de Astrobiología (CSIC-INTA), Spain), M. T. Eibe (CSIC-INTA, Spain), A. Ullán (CSIC-INTA, Spain), F. Organero ( Observatorio astronómico de La Hita, Spain), S. Pastor (Observatorio de la Murta, Spain), J. A. de los Reyes (Observatorio de la Murta, Spain), S. Pedraz (Calar Alto Observatory, Centro Astronómico Hispano Alemán, Spain), A. Castro (Sociedad Astronómica Malagueña, Centro Cultural José María Gutiérrez Romero, Spain), I. de la Cueva (Astroimagen, Spain), G. Muler (Observatorio Nazaret, Spain), I. A. Steele (Liverpool JMU, UK), M. Cebrián (Instituto de Astrofísica de Canarias (IAC), Spain), P. Montañés-Rodríguez (IAC, Spain), A. Oscoz (IAC, Spain), D. Weaver (Observatório Astronomico Christus, Colégio Christus, Brazil), C. Jacques (Observatório CEAMIG-REA, Brazil), W. J. B. Corradi (Departamento de Física – Instituto de Ciências Exatas – Universidade Federal de Minas Gerais (ICEx–UFMG), Brazil), F. P. Santos (Departamento de Física, ICEx–UFMG, Brazil), W. Reis (Departamento de Física, ICEx–UFMG, Brazil), A. Milone (Instituto Nacional de Pesquisas Espaciais (INPE-MCT), Brazil), M. Emilio ( Universidade Estadual de Ponta Grossa, O.A. – DEGEO, Brazil), L. Gutiérrez (Instituto de Astronomía, Universidad Nacional Autónoma de México (UNAM), México), R. Vázquez (Instituto de Astronomía, UNAM, México) & H. Hernández-Toledo (Instituto de Astronomía, UNAM, México).